A key to The Nation's interactive database. 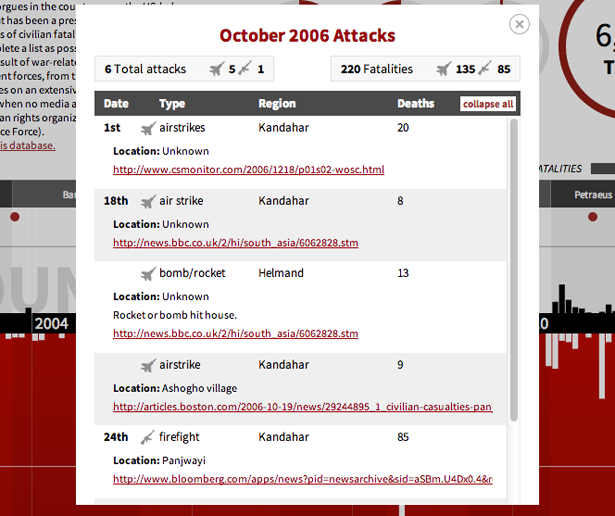 The Nation’s interactive database of civilian casualties in Afghanistan is an attempt to compile as complete a list as possible of all known civilian deaths that have occurred in the country as a result of war-related actions by the United States, its allies and Afghan government forces, from the invasion in October of 2001 through the end of 2012. Air: This includes fixed-wing (airplanes) and rotary-wing (helicopter) attacks. 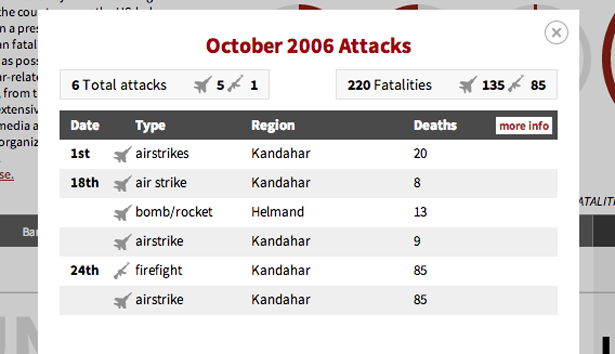 These are frequently listed as airstrikes or bombings in this database. Ground: This includes everything from small arms fire by troops on the ground, to escalation of force incidents at checkpoints, to mortars, artillery, portable rocket systems, etc. Also included in this category are events with too little information to ascertain the cause, as well as incidents with multiple methods of attack (e.g. artillery and airstrike used in tandem). The minimum and maximum reported civilian deaths from any given incident often differs starkly depending on whether the count comes from villagers on the ground, an NGO's findings, or NATO's official press office. To impartially take these differences into account, users can toggle between the estimated minimum and maximum fatality counts that have occurred throughout the conflict. Hovering over any month’s bar provides a snapshot of the fatalities and attacks that occurred during that month, and whether they occurred by air or on the ground. Clicking on any given bar will bring up a scrollable menu of all the attacks that occurred in that month. Clicking the “more info” tab will expand the listings of each attack to reveal a specifics of the attack and relevant source material. CAS: Close Air Support. Casualties caused by fixed-wing aircraft. CCA: Close Combat Air. Casualties caused by helicopters. EoF/RoE: Escalation of Force / Rules of Engagement. Casualties at checkpoints and on roads. DF: Direct Fire. Casualties caused by ground forces with line of sight. IDF: Indirect Fire. Casualties caused by ground forces without direct line of sight. RTA: Road Traffic Accident. Noncombat casualties involving ISAF vehicles.